Looking to improve your Olympic lifts and gain strength? Maybe you’re training to get better at CrossFit or maybe you’re jumping in straight off the couch. Either way, you can take a step towards accomplishing your goals by joining us in the fight against mediocrity. This is a no-nonsense program, designed for athletes of all skill and experience levels with minimal gym equipment required. 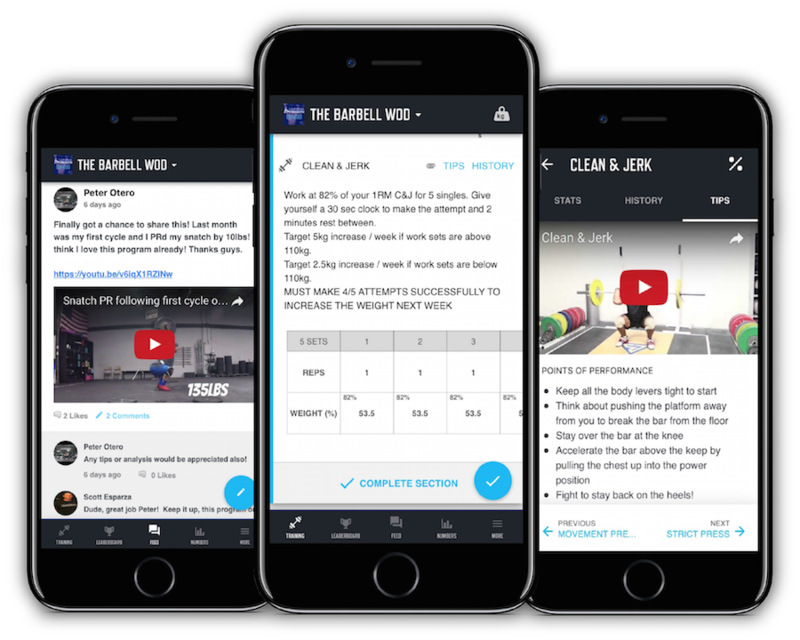 Whether you’re getting after it in your garage gym or training at a local gym, the Barbell WOD program combines the best of Olympic lifting and Powerlifting movements into 60 minute workouts. Take your coach on the go. Imagine what you can accomplish by dedicating just 4% of your day to training. I wanted to share my 10lb PR on my clean! #155! It's been a year being stuck at #145!! Who would have thought and I am the lightest I've been ever at 54kg! Thank you Barbell WOD for your awesome programming!! I absolutely love this program! I've been following it for a couple months and I've PR'd my overhead squat at 200#s, clean at 210#s and clean & jerk at 205#s in this past month alone! This is exactly what I've needed to take my training to the next level. Gain instant access to two weeks of free workouts. No credit card required. Gain access to Monthly Programming + Unlimited Video Analysis. Cancel anytime. The program is set, the rest is up to you.